Chom Chom Roller – Best Dog Hair Remover?? How To Clean My House? Where to Start? Shower Cleaner with Dawn and Vinegar – Easy and It Works! How To Fold Fitted Bed Sheets? Best Closet System – Which Is Best For You? Looking for online jobs for stay at home moms? What Is Affiliate Marketing and How To Get Started? 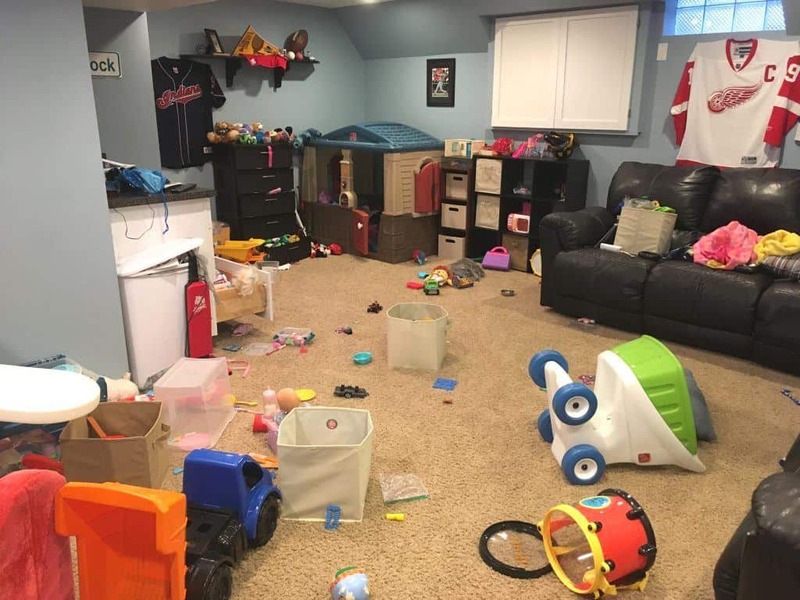 I think almost every mom has that moment of looking around her home and seeing toys all over the place. Unfortunately, I know I definitely had this moment many, many times. Are you looking for some ideas to help to organize your children’s toys? 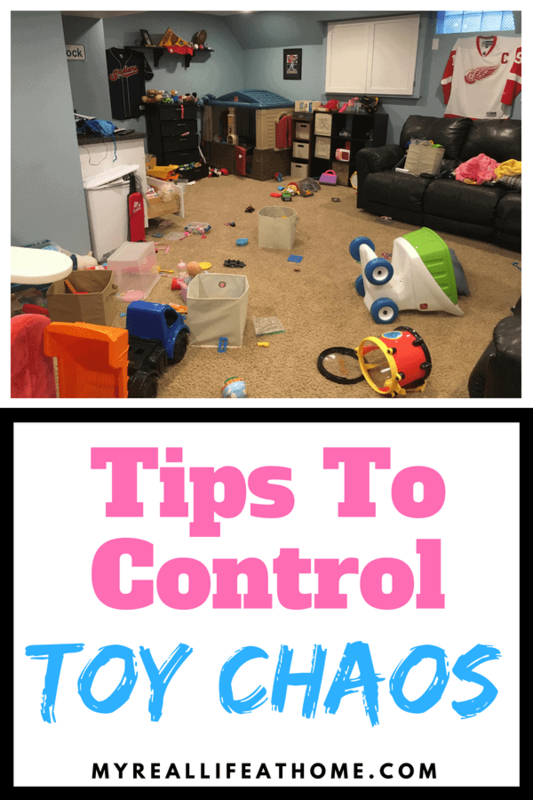 Here are a few tips and tricks that I use to help control the toy mess in our home. After reading this, you may also realize that you already have some storage solutions but you just need to use them in a different way. If your home is anything like ours, we have many different sized toys – big, small, long, short and everything in between. Obviously, you will need different toy storage options for the different size toys. 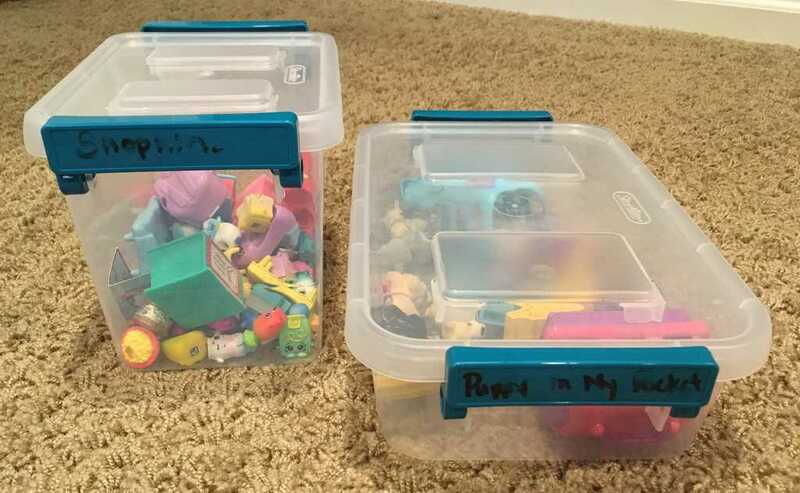 It will be frustrating for your child if they are hunting for a teeny, tiny toy in a giant storage box or if they are struggling to put a large toy into a medium size box. We love cube storage since it can hold a variety of different toys (small to medium size), as well as books. They come in a variety of sizes so you can pick exactly the size you need for your amount of toys. If you have some medium, awkward size toys, you may decide to just set it on the shelf and not in a fabric cube. We have done that in that past with toys such as trucks, remote control cars, medium size dolls, etc. There are also so many colors and styles of fabric cubes. You can mix and match and show your personality or just match your room color – the choices are endless. Make sure you buy the correct size fabric cube as the divided cube storage sizes due vary sometimes between brands. Cube storage offers a simple look with lots of functionality! 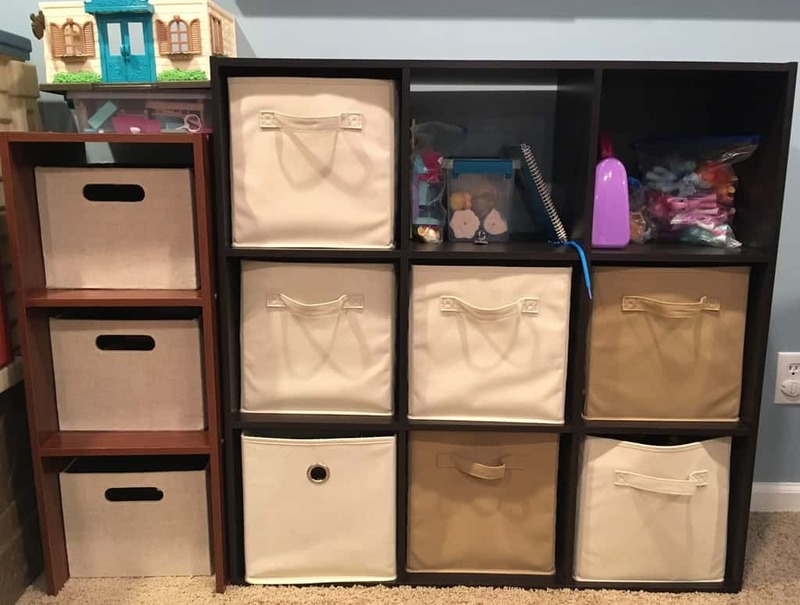 You can purchase storage cube organizers like the one pictured on Amazon for around $45. There are many other options if this particular one doesn’t suit you. 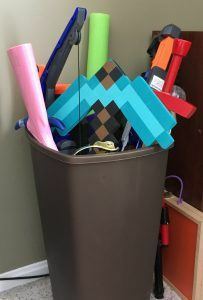 Don’t forget to purchase the proper size storage cubes. So what about the toys that do not fit in the fabric storage cubes. We use a set of plastic drawers for those items. Since they are wider, it allows you to store those longer, larger items. I have my drawers organized for toys for my son, my daughter and two for shared toys. They have a variety of drawer sets in all different price ranges. The only drawback I find to the set we have is that the drawers don’t completely come out. I realize that is great for safety reasons for smaller kids however, I find it easier if they can take the drawer over to their toys for clean up. That is one of the benefits of the storage cubes. 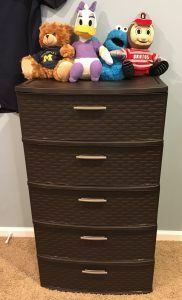 You can purchase a similar one but with 4 drawers on Amazon for around $40, although there are lots of other options as well. As my son is getting older and his toys are changing, I realize that his toy storage options are also changing. A couple things he loves are Star Wars and Legos which means he loves Star Wars Legos sets. Usually, he gets at least one for his birthday or Christmas. He doesn’t really play with them very often because if some pieces fall off, it is sometimes hard to figure out how to put it back together. (Side note, I have spent lots of time searching online for the directions to put the sets back together. If you find yourself in a similar situation, search the internet – usually, you can find an online version of the directions). So back to the problem – once they are built, where do you put them? A bookshelf is a great option for more than just books. I ordered a tall bookshelf and some fabric cubes and made a great storage solution for his toys and books. 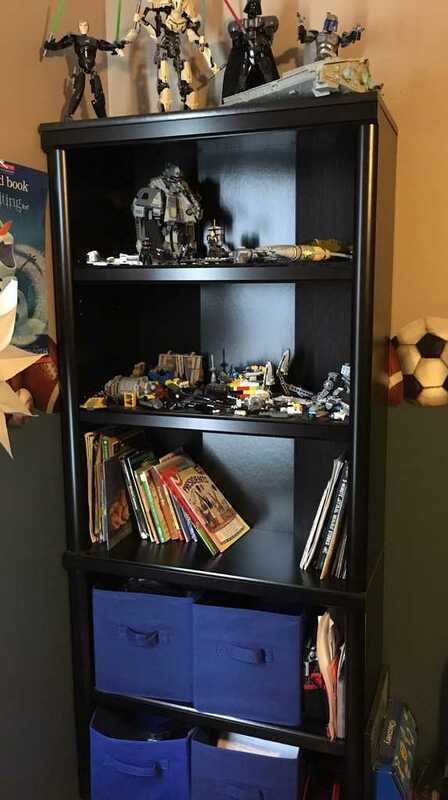 It allowed me to store his Lego sets and figures, books and miscellaneous toy all in one place. It offers great storage flexibility since you can decide how to organize your bookshelf – lots of cubes, no cubes or anything else in between! Nerf Guns, Light Sabers, Swords??? Our kids love Nerf guns and lightsaber (pool noodles cut in half) battles. Again, it seems every year they get at least one new Nerf gun which leads to more toys. For a long time, we struggled with how to store these. They are taller than most toys and don’t fit in storage cubes or regular size containers, so we ended up with a pile on our living room floor. Of course, that never looked neat or organized, so we finally came up with an easy solution. My solution? A plastic trash can! I can’t remember the exact size I purchased but I think between 10-14 gallons. It’s the usual kitchen size. Mine came with a lid but I just stored the lid away since I didn’t need it. It is a perfect solution for our selection of long Nerf guns, etc. Now they are stored standing up and out of the way and the kids know where to find them and where to put them away! It would appear that a requirement for a lot of my daughter’s toys is that they are tiny. Shopkins, Puppy In My Pocket, Trolls to name a few. They are all small and end up all over the house. Even the storage cubes are too big to store these items. The tiny toys always end up at the very bottom of the cube and then everything has to get dumped out in order to even see if her toy is in the cube! Of course, this makes an even bigger mess! My solution to these little toys is small plastic storage containers. I found mine at Walmart and I love them although I am sure you can find them almost anywhere. One of the main reasons I like these storage containers is because they come in different sizes which allows me to sort her toys. For example, she has a separate bin for each of these – Shopkins, Puppy In My Pocket, Trolls, Frozen, etc. I would suggest either you buy clear ones so they can see what it in them or to make sure they are labeled. Also, I love that the latches on these ones are easy to unlock so it’s perfect for smaller hands. As I am writing this, I realized that we just have too many toys!!! Stuffed animals are another toy that we have in abundance. My son especially loves stuffed animals so if we go somewhere special or vacation, he usually comes home with one. He used to have them all in bed with him but then he was running out of space to sleep but he doesn’t want to get rid of them. I realize at some point it will have to come to that but I am not ready for that right now. As I was scrolling through Facebook I saw the perfect storage solution for stuffed animals. This stuffed animals storage bean bag chair was perfect. It’s a zippered pouch that allows you to store stuffed animals, blankets or anything soft inside. I know some people have asked me if it’s comfortable sitting on stuffed animals but honestly, I tried it and I don’t find it that bad. He has never complained about it. When his room gets vacuumed, it gets shaken to readjust the stuffed animals. End result – he could keep his animals, I wouldn’t have to see them and he has a comfy chair to sit on in his room! This is the XL size and holds approximately 100 animals. There is also a smaller size. You can purchase it on Amazon for approximately $30 which was definitely worth it in my opinion. One other storage option we have used are collapsible toy boxes. Our kids liked these because you can buy different themed ones. The one I found a few years ago, you can unzip the box, it turns into a play mat. My son has a Star Wars one and my daughter has a Barbie one. My daughter stores her Barbies in her box and then takes them out to play on the mat. They aren’t overly sturdy so you can’t store heavy items. The lid does velcro on the box and they are good for lightweight toys. You can purchase them on Amazon. The prices do vary depending on the style and theme you purchase. Do you want to know what the best part of all of this is? Organized toys? Nope. Fewer toys scattered over the house? Nice, but no. The best part to me is that with these easy solutions, the kids actually clean up the toys better. Just like I find with me, when things have a specific home it is easier to put them away. Now they know that if they put the toys in the proper place, they will know where to find it when they want to play with it! Do they always clean up? Of course not but this has definitely helped! 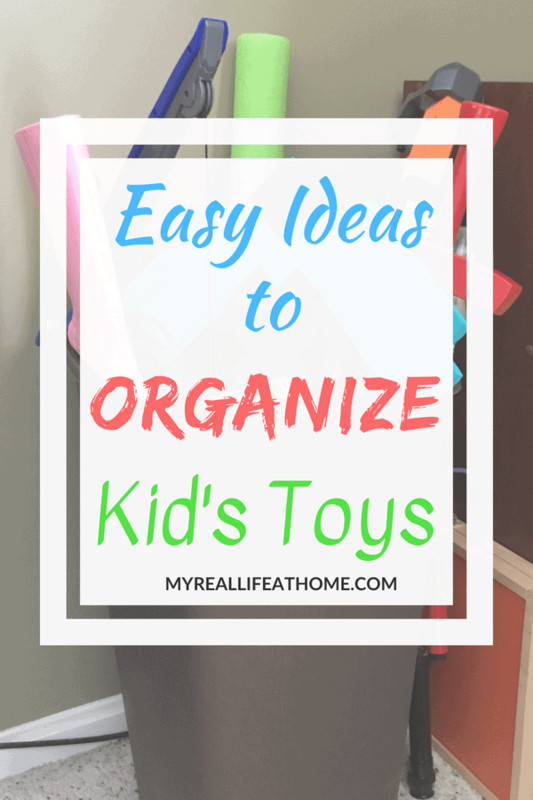 I would love to know if any of these organizing toys ideas worked for you. Or do you have a different toy storage solution that you use? I would love to hear it! Please leave it in the comment section below or if you have any questions, please let me know. My daughter is always looking for ideas to keep their toy room neat. Will be sending this to her, she will appreciate the ideas. I hope the organizing ideas will help her. In my house, keeping toys neat is often a struggle. Kids toys are always a challenge to keep organized. My kids each have their own cubbies to store their figures in and I use the tall plastic hampers to store their nerf guns. It is a challenge and somehow I think our toys keep multiplying. I need to get another plastic hamper as our current one is overflowing. I’m going to do a toy declutter in the next couple of weeks! You’ve given some good ideas. I really love the stuffed animal storage idea! The stuffed animal storage bean bag is great! I am so glad I found it. The stuffed animal chair is an amazing idea! I love it! It was a win-win for our house. My son got to keep his stuffed animals and I don’t have to see them all over his bed and floor 🙂 It is functional and looks great! I am always searching for new ways to organize all our toys. This looks great! Glad I was able to help. I feel like because toys are all different shapes and sizes, toy storage requires many different solutions. These are great tips! Toy organization is a real struggle! I love all the little boxes and bins you can find at the Dollar Tree. Bookshelves and cubbies are my go to’s! Little boxes and bins are a lifesaver for us. While I love that my daughter has small toys (take up less space), they are easily spread all over the house. Having a designated space for them helps. Some great ideas here! I like the trash can for taller items, and a stuffed animal “bean bag” chair is such a clever way to keep all your stuffed animals. I’ve seen those toy boxes that collapse – too fun. I think the stuffed animal “bean bag chair” is my favorite toy storage solution that I have. Great ideas! At least once a day I’m tempted to throw all of my kids’ toys in the garbage, due to complete lack of organization. At the moment they’re overflowing in a bunch of IKEA baskets. Thanks for these tips! Well having fewer toys is definitely easier to keep clean. Although I have discovered that getting them out the house is more difficult than I would like (unless the kids don’t see). Bins are a life saver and make clean up so easy. I love the cube shelves too. I love the fact that both of these options can be moved to where they are playing with the toys for easy clean up. Great ideas! So using the one for the Nerf Guns and Light Sabers! Why have I never thought of that!?! I had went to the store with intentions of looking for a large storage tote but realized the garbage pail was cheaper and would do the same job. The tiny toys are killers! Whenever my kids aren’t looking I throw out as many tiny things as possible. I hate stepping on them and I hate picking them up. Haha. Can you tell I had a moment this morning of looking around my house and being totally frustrated by the amount of stuff all over the floors?! Today might be a purging day! Unfortunately, I know that feeling well. We are in the middle of packing to move and there has been a lot of purging of toys! I’m a wife and stay at home mom of two from Ohio. I wanted to create a place where women of any age or stage – single, married, mom, widow – can share life together, while also sharing anything that can make life easier and simpler.